Copula built as an ordinal sum of copulas. The collection of copulas of dimension . The bounds are such that the copula is squeezed into . with the Min-copula: and where, for convenience, we noted and . Note that if then the copula is erased from the list, for . getBounds() Accessor to the collection of bounds. getCopulaCollection() Accessor to the collection of copulas. setBounds(bounds) Accessor to the collection of bounds. setCopulaCollection(coll) Accessor to the collection of copulas. Accessor to the collection of bounds. 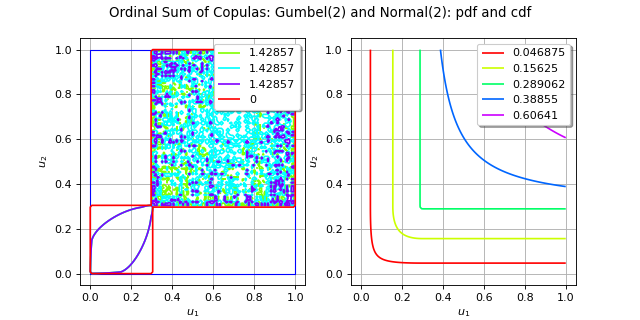 Bounds defining the intervals on which the copulas of the collection are squeezed. Accessor to the collection of copulas. List of copulas that build the ordinal sum. 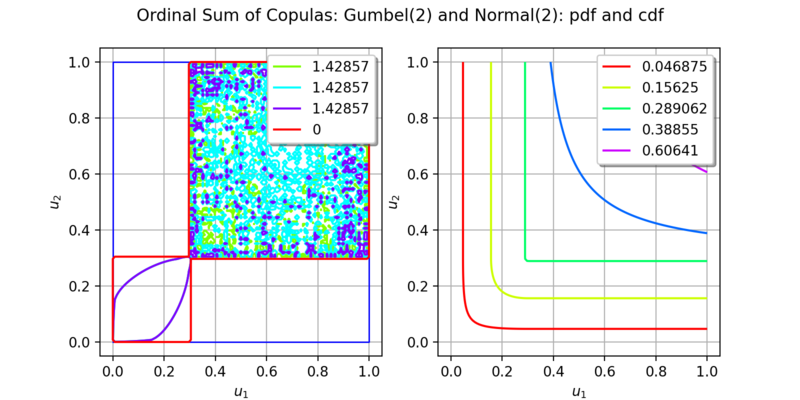 Bounds defining the intervals on whch the copulas of the collection are squeezed.